Meadow grass contains essential nutrients that, when dried in hay, will keep livestock sustained over the winter. Like most farmers at this time of year, I’ve got my eye on the weather watching for the omens that promise a period of uninterrupted productivity. The crop of hay that will feed my stock over the winter is still in the fields ready to be harvested and has been rather battered by all the rain of late. As I sit and write this missive a small ray of sunshine has pierced the otherwise grey skies and burst through the kitchen window in a thin sliver of golden light that pools on the breakfast table. It will need more than this small ray to dry out the meadow before the process of cutting, turning and baling can commence. Haymaking is an activity that ideally requires a prolonged period of warm, dry weather; hence the old adage of making hay while the sun shines. So I wait anxiously for a period of sunny weather and the increase in temperature that will herald the beginning of harvesting. After all the anxiety, when the crop is finally brought in and stored for the winter, comes the enormous sense of satisfaction on seeing the barn filled to the top with fresh-smelling hay. Of course every cloud has a silver lining and while the rain has latterly been delaying haymaking it has been filling the catchments on the New Forest. The New Forest catchment is rare in lowland England because it is situated in a vast area of uncultivated lands, which make up the Open Forest. This means that the New Forest aquatic habitats are the very best places to see a rich diversity of plant, bird and animal species that depend upon its unique and watery ecosystem; and demonstrates why this precious landscape attracts such high level of environmental protection. But the forces of nature can be very mercurial and it was reported that on Wednesday 2nd July 1760 ‘so violent a storm of rain, attended with thunder and lightening, fell near Fordingbridge and Ringwood, in Hampshire, that the water of the brooks running from the New Forest into the river Avon, was, in less than an hours time, raised to the height of ten or twelve feet perpendicular’. The story continued and seemed to imply a major flash flood had occurred. ‘Great quantities of hay and thread, which was whitening in the meadows near Fordingbridge, were swept away by the inundation, as were also great numbers of hogs, together with their sties. At Gorely eighteen hogs were carried off at once, but saved by the diligence of a neighbouring farmer.’ This episode from history indicates that the British summer has always had an element of unpredictability and that unseasonal floods are a natural, if albeit unwelcome, occurrence. Because fortunes were often closely linked to the outcome of the weather, our forefathers spent much time observing the natural world and reading its portents. They were able to pass on their folk-wisdom and weather-lore, such as predicting rain on seeing cows lying down, swallows flying low or down flying off colt’s foot, dandelion and thistles when there is no wind. Forecasts that even today rival any of those by the Met Office. 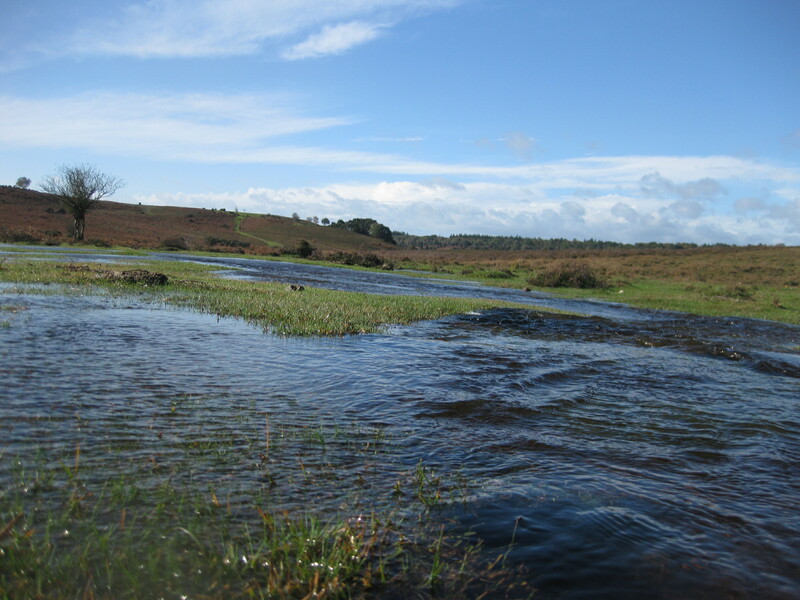 Water flow on the New Forest heathland after heavy rain. 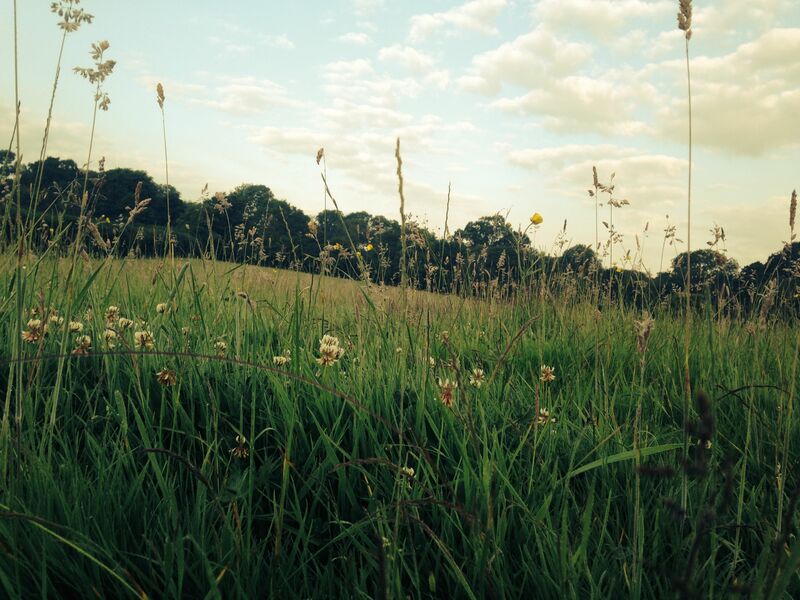 Keeping the history, ecology and cultural traditions of the New Forest alive through practice of 'commoning'. Sharing information about #NewForest & #commoning. This entry was posted in New Forest and tagged catchment, ecosystem, England, environment, flash flood, flood, flooding, fodder, folk-wisdom, Fordingbridge, Hampshire, hay, livestock, lowland, Met Office, New forest, Ringwood, river, silage, water, weather, weather-lore. Bookmark the permalink.